Do you have small windows and looking for the right window treatment for them? Then you are on right page, the following article offers some unique ideas and solutions on window treatment for small windows. There are lots of ideas and tips for small window treatments that can give the illusion of size and that will suit your style and décor. As we all know that windows are the essential part of every home. Windows are not only the source to get natural light and fresh air in house but they also add beautiful touch to the room. Many people have small windows in their house and often find it difficult to find the right window treatments for them. It may seem challenging to find window treatments for small windows but it is not as difficult as it looks There are numbers of window treatment ideas for small windows like use of shutters, curtains, films and many more which can enhance the beauty of these small windows as well as your home without burn a hole in your pocket or take up too much time. Panels: Use panels to cover the small windows as these can give an illusion that the small window is bigger than it actually is. Choose light color panels for small windows. If the width of the window is small than use panels that are wider than the window this. You can also use some other accessories like visually appealing wood poles, ring tops, brackets, and finials to complete the look. Window Films and Tints: To cover the small windows with Window film is also a good idea especially for the bathroom windows as they provide privacy for a bathroom window or can help to filter sunlight in a dormer window or skylight. Window film is a vinyl-like material that you can cut to fit odd-shaped or small windows. It is available in many colors and pattern, if you do not want more sunlight to enter the room, and then use a dark-colored window film for sufficient amount of light use light colored window film. Window film can be removed easily and you can remove it any time. Curtains are one of the best small window treatment ideas. It is good to choose the curtains according to your room décor instead of opting for curtains that match with the style of the window. Use dark color curtains having bold designs in order to draw attention to the smaller windows. Use light colored panels that start above the panel and puddle on the floor, making the window appear big in size. Use curtains with deep pelmets, in order to make the windows look tall and deep. Lace curtain panels work well in dormer windows when hung on an unobtrusive cafe curtain rod. You can use curtain poles to decorate your small windows, there are different variety of curtain poles available in the market. You can opt for decorative and dark-colored curtain poles. If you want to make the windows look big in size, then you can use curtain poles that extend the window. Hanging the curtains to these curtain poles, will definitely make the windows appear big. Use Mini blinds to decorate your small windows, they come in a wide selection of colors, finishes, they are once again in high demand and perfect for children's rooms, with the vinyl, aluminum and faux wood particularly good in rooms where humidity may be a concern, such as your bathroom, sunroom, kitchen, etc. 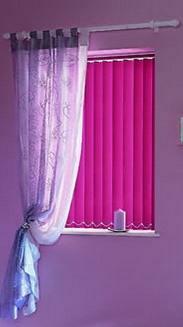 Vertical blinds look good on small windows, as they make them appear big in size. Drapes: If you have a small windows than you can use drapes to highlight them. Drapes look beautiful and give volume to your window. It comes in many colors and fabric so you can match them easily with the look of the room and also, with the furniture present in the room. The window treatment ideas for small windows will help you to add some beauty to the windows as well as your rooms. So without worrying the size of the window just use these ideas and see how these windows can change the total ambience of your room. You can also use your own curtains or art work to decorate these small windows.